Contrast between 1851 and 1865. The idea of colonizing the Jews as agriculturists in Russia originated with the Polish historian Czacki and Nathan Nata (Notkin), who in turn inspired the poet Derzhavin, whom Emperor Paul sent to White Russia in 1799 to investigate the famine in that government and to take proper measures of relief. "To check the selfish occupations of the Jews," Derzhavin recommended that a special class of agriculturists be formed and transferred to the governments of Astrakhan and New Russia, hoping thus to relieve White Russia of a portion of its dense population. On October 9, 1802, a special commission, the first of its kind in Russia, was organized by the benevolent Emperor Alexander I., to consider Derzhavin's recommendation and to draft a plan for improving the condition of the Jews. One Jewish delegate from each government of the Pale of Settlement was elected to confer with the representatives of the government. As a result of the two years' work of this commission an "Enactment concerning the Jews" was sanctioned by the czar, and promulgated December 9, 1804. It contained the following provisions: (1) The Jews of Russia were to be grouped into five classes, viz., agriculturists, manufacturers, artisans, merchants, and minor burgesses. (2) The agriculturists were permitted to buy and rent lands in all the western and southwestern provinces and to cultivate their farms themselves or with hired help. (3) For those without means the government pledged itself to provide 30,000 deciatines (1 deciatine = 2.70 acres) of land in the western and southern governments. (4) All Jews that wished to become colonists were required to submit certificates of their physical fitness for agricultural pursuits; and each family had to give proof of the possession of not less than 400 rubles with which to pay for the land, implements, and household necessaries for settlement. (See "Polny chronologicheski Sbornik zakonov i polozheni kasayushchikhsya yevreyev" (Complete Chronological Collection of Laws and Regulations Concerning the Jews), compiled by V. O. Levanda, pp. 53 et seq., St. Petersburg, 1874. In 1806 many Jewish families from the governments Vitebsk and Mohilev on the Dnieper removed to southern Russia and founded the first seven agricultural colonies in the government of Kherson. They were named: Nahar-Ṭob, Har Shefer, SedeMenuḥah, Bobrovy-Kut, Jefeh-Nahar, Jaazer, and Kamenka. These lands had previously been inspected by Nahum Finkenstein and Lieberman, who were commissioned to do so by the Jews of Vitebsk and Mohilev, with the consent of the minister of the interior (Nikitin, "Yevreiskiya Zemledelcheskiya Kolonii," 12). The authorities in charge of colonization were directed to establish settlements in territories well adapted for agricultural purposes. The colonies were to be founded at certain distances from Christian settlements, and the Jewish colonists were denied the right to purchase land in Christian villages. Every occupation not in the line of agriculture was strictly prohibited. The colonial authorities were to lend the Jews all possible assistance and protection. Unfortunately for the settlers, the officials selected territories more adapted for cattle-breeding and agriculture on a large scale than for small farms; and those colonists who had settled on their own account were left almost without the necessary means to purchase implements and food. Exhausted by the long and weary journey, andunaccustomed to the climate of the sparsely settled South Russian steppes, many fell ill and died; while others sold their estates for next to nothing and returned to their old homes or left the country altogether. Only the poorest remained in the colonies; and these led a miserable existence, hoping in vain for the support promised by the government. Notwithstanding the drawbacks, 1,690 families had been settled in these colonies up to the year 1810. On April 6 of that year an edict was issued, discontinuing the transfer of Jews to New Russia, all the funds assigned by the government having been expended. In 1819 General Intzov, chief superintendent of South Russian colonies, inspected the Jewish settlements, and he reported on them so favorably that the question of continuing Jewish colonization was discussed at St. Petersburg. In 1823 a loan of 50,000 rubles was granted for colonization purposes, and this enabled 443 families to settle—partly in the old colonies and partly in new settlements. In the same year further emigration to New Russia was stopped by the government. Under the conscientious management of General Intzov, the economic condition of the colonies improved; but his strict administration and almost military discipline drove many of the colonists away. His plan of distributing the free farms—by which the colonists were grouped together, not by families, but to suit the convenience of the management—was detrimental to the development of the colonies. 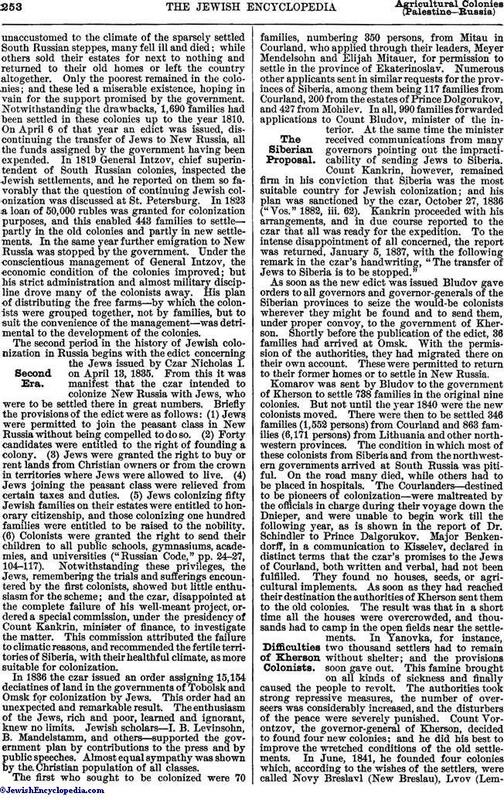 The second period in the history of Jewish colonization in Russia begins with the edict concerning the Jews issued by Czar Nicholas I. on April 13, 1835. From this it was manifest that the czar intended to colonize New Russia with Jews, who were to be settled there in great numbers. Briefly the provisions of the edict were as follows: (1) Jews were permitted to join the peasant class in New Russia without being compelled to do so. (2) Forty candidates were entitled to the right of founding a colony. (3) Jews were granted the right to buy or rent lands from Christian owners or from the crown in territories where Jews were allowed to live. (4) Jews joining the peasant class were relieved from certain taxes and duties. (5) Jews colonizing fifty Jewish families on their estates were entitled to honorary citizenship, and those colonizing one hundred families were entitled to be raised to the nobility. (6) Colonists were granted the right to send their children to all public schools, gymnasiums, academies, and universities ("Russian Code," pp. 24-27, 104-117). Notwithstanding these privileges, the Jews, remembering the trials and sufferings encountered by the first colonists, showed but little enthusiasm for the scheme; and the czar, disappointed at the complete failure of his well-meant project, ordered a special commission, under the presidency of Count Kankrin, minister of finance, to investigate the matter. This commission attributed the failure to climatic reasons, and recommended the fertile territories of Siberia, with their healthful climate, as more suitable for colonization. In 1836 the czar issued an order assigning 15,154 deciatines of land in the governments of Tobolsk and Omsk for colonization by Jews. This order had an unexpected and remarkable result. The enthusiasm of the Jews, rich and poor, learned and ignorant, knew no limits. Jewish scholars—I. B. Levinsohn, B. Mandelstamm, and others—supported the government plan by contributions to the press and by public speeches. Almost equal sympathy was shown by the Christian population of all classes. The first who sought to be colonized were 70 families, numbering 350 persons, from Mitau in Courland, who applied through their leaders, Meyer Mendelsohn and Elijah Mitauer, for permission to settle in the province of Ekaterinoslav. Numerous other applicants sent in similar requests for the provinces of Siberia, among them being 117 families from Courland, 200 from the estates of Prince Dolgorukov, and 427 from Mohilev. In all, 990 families forwarded applications to Count Bludov, minister of the interior. At the same time the minister received communications from many governors pointing out the impracticability of sending Jews to Siberia. Count Kankrin, however, remained firm in his conviction that Siberia was the most suitable country for Jewish colonization; and his plan was sanctioned by the czar, October 27, 1836 ("Vos." 1882, iii. 62). Kankrin proceeded with his arrangements, and in due course reported to the czar that all was ready for the expedition. To the intense disappointment of all concerned, the report was returned, January 5, 1837, with the following remark in the czar's handwriting, "The transfer of Jews to Siberia is to be stopped." As soon as the new edict was issued Bludov gave orders to all governors and governor-generals of the Siberian provinces to seize the would-be colonists wherever they might be found and to send them, under proper convoy, to the government of Kherson. Shortly before the publication of the edict, 36 families had arrived at Omsk. With the permission of the authorities, they had migrated there on their own account. These were permitted to return to their former homes or to settle in New Russia. Komarov was sent by Bludov to the government of Kherson to settle 738 families in the original nine colonies. But not until the year 1840 were the new colonists moved. There were then to be settled 346 families (1,552 persons) from Courland and 863 families (6,171 persons) from Lithuania and other northwestern provinces. The condition in which most of these colonists from Siberia and from the northwestern governments arrived at South Russia was pitiful. On the road many died, while others had to be placed in hospitals. The Courlanders—destined to be pioneers of colonization—were maltreated by the officials in charge during their voyage down the Dnieper, and were unable to begin work till the following year, as is shown in the report of Dr. Schindler to Prince Dalgorukov. Major Benkendorff, in a communication to Kisselev, declared in distinct terms that the czar's promises to the Jews of Courland, both-written and verbal, had not been fulfilled. They found no houses, seeds, or agricultural implements. As soon as they had reached their destination the authorities of Kherson sent them to the old colonies. The result was that in a short time all the houses were overcrowded, and thousands had to camp in the open fields near the settlements. In Yanovka, for instance, two thousand settlers had to remain without shelter; and the provisions soon gave out. This famine brought on all kinds of sickness and finally caused the people to revolt. The authorities took strong repressive measures, the number of overseers was considerably increased, and the disturbers of the peace were severely punished. Count Vorontzov, the governor-general of Kherson, decided to found four new colonies; and he did his best to improve the wretched conditions of the old settlements. In June, 1841, he founded four colonies which, according to the wishes of the settlers, were called Novy Breslavl (New Breslau), Lvov (Lemberg),Romanov, and Novo Poltavka (New Poltavka), and settled there 700 families ("Vos." 1882, vol. 7). Kartzev's report of 1845 showed that there were 1,661 families (12,779 persons) in the Kherson colonies. Of these, 11,099 individuals were settled by the government; the rest, having paid for their farms, settled on their own account. 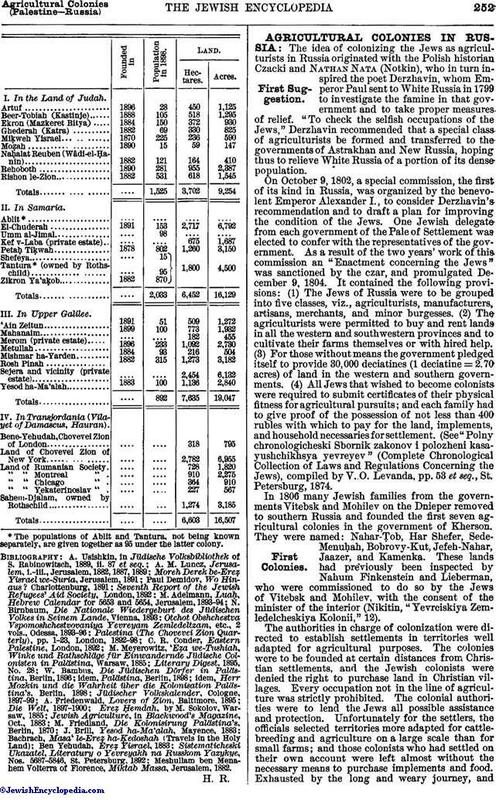 From 1841 to 1845 the government expended 234,-539 rubles in aiding Jewish colonists in Kherson. In the fifteen colonies there were 5 synagogues, 12 houses of prayer, 6 town-halls, 7 warehouses, 7 bath-houses, 1 seed-warehouse, 8 windmills, 463 horses, 2,332 sheep, 3,322 oxen, 1,117 wagons, 289 plows, and 533 harrows. Of the colonists 3,308 were entered in the books as taxpayers. The colonies had an income of 3,363 rubles per annum, besides rents from distilleries and restaurants kept by Jews who were not colonists. The local authorities of the fifteen Jewish villages named in the table were 11 mayors, 22 assessors, and 11 clerks. Religious affairs were administered by 12 rabbis, assisted by 30 parnasim ("directors") and 16 treasurers. The five synagogues were maintained at the expense of the communities. Most of the colonists originally belonged to the merchant class, 833 persons only being artisans. Only the tailors (359), shoemakers (144), and blacksmiths (11) found employment in the colonies; the others either sought employment or established themselves in surrounding towns. The death-rate of the colonies was very high. To every birth there were over twenty deaths. The poor results shown were due to the inexperience of the colonists, the corruption of the officials, and the absence of all instruction from more experienced colonists. This was practically confessed by the Russian officials in their reports to Czar Nicholas, who took a deep personal interest in the whole matter (see Kisselev's report, June, 1845). In 1846 the colonies were put under the management of the Ministry of Domains, a special Jewish fund, called korobka ("basket fund"), being set apart for the necessary expenditures. As regards the colonies in Ekaterinoslav, a report made in 1847 by Baron Stempel, superintendent of the colonies, shows that the settlers on arriving in Ekaterinoslav generally found no provision made for them. They were not permitted to repair the dilapidated shanties which served for houses, and were not even allowed to seek shelter in the neighboring villages until spring, as Stempel had suggested. Those who did so were cruelly driven back by Cossacks. Epidemics of scurvy and smallpox occurred soon after ("Archives of Kherson-Bessarabia Board of Administration," report of Feb. 15, 1849, No. 116; see also Harold Frederic, "The New Exodus," pp. 78, 79, New York, 1892). After 1849, Jewish immigrants from northwestern Russia were directed chiefly to the government of Ekaterinoslav, where, up to 1856, fifteen colonies, sheltering 766 families, were founded. The Ekaterinoslav colonies were under the management of a director appointed by the Kherson-Bessarabia bureau of government domains, and were divided into four districts, with an overseer at the head of each. The colonists elected their own aldermen, all the other authorities being Christians. Hebrew schools (ḥedarim) were prohibited in the colonies. *1 deciatine = 2.70 acres. Of the hired help, 106 persons were Christians and 25 were Jews (K. Sluchevski, "Yevreiskiya Kolonii," in "Russki Vyestnik," iv. 206, 1890). In 1856 Evzel (Joseph) Günzburg gave the government 10,000 rubles, the interest of which was to be applied in providing annual rewards for the best Jewish farmers; the recipients to be determined by the Minister of Domains ("Civil Code," vol. xxxi. No. 30, 672). After 1856 only four more colonies were founded; namely, two in the government of Kherson and two in that of Ekaterinoslav. Under a law enacted in 1866 Jewish colonization ceased entirely. The measure was adopted mainly for financial reasons, the basket fund no longer sufficing for both colonization and education. Besides this, New Russia was no longer in need of artificial colonization. The reports of V. A. Islavin, an official who visited the colonies in 1851 and again in 1865, enable a comparison of those years to be made. Instead of the 15 colonies in 1847 there were 37 in 1865—20 in Kherson and 17 in Ekaterinoslav; the 2,210 families in 1851, consisting of 14,780 persons, had increased in 1865 to 2,873 families, consisting of 32,943 persons; and instead of 85,563 deciatines of cultivated land in 1851, there were in 1865, 129,521 deciatines. In 1869 the Ministry of Domains instituted an inquiry respecting the Jewish settlers of the New Russian colonies, in order to ascertain how many of them really occupied themselves with agriculture and how many were indigent and worthless. As a result, in the course of ten years 10,359 men, women, and children were expelled from the class of agriculturists. In 1874 all reserve lands, which had been counted as part of the colonies, were taken away from them. The above numbers have since considerably decreased. Percentage of all the Land in the Government. Percentage of Jewish Population in the Government. Kovno 4,033 2,252 36,432 42,717 1.3 19. The preceding table, published in "Statisticheski Vremennik Rossiskoi Imperii" (Statistical Annals of the Russian Empire), 3d series, part 2, edited by V. Alenitzyn, St. Petersburg, 1884, shows the extent of land owned and leased by Jews in western and southwestern Russia in 1881. These results were the more remarkable because it was exactly in this year 1881 that the colonies received the greatest check to their development by the riots, which actually reached the colonies of Kherson and Bessarabia and disturbed the sense of security in all the rest. Several of the best Jewish farmers in Bessarabia emigrated in that year to the United States and Palestine. The May Laws of 1882 (put into application in 1891) influenced the development of the Agricultural Colonies of Russia only indirectly. They put a stop to all immigration of the Jewish inhabitants of the towns into the villages, and indeed sent no less than 50,000 from the villages into the towns. By this means the development of agricultural tastes among the Russian Jews was effectively arrested. But the Agricultural Colonies were particularly exempted from the operation of these enactments. In 1880 a fund to promote handicraft and agriculture among the Russian Jews was initiated, with a capital of 200,000 rubles, by S. Poliakov, Baron H. Günzburg, A. Sack, Leon Rosenthal, M. Friedland, and others. Seven years later (1887) the amount of this fund (1,110,-271 rubles) was turned over to the general fund of the government treasury. In 1891 an agricultural school, affiliated with the Jewish Orphan Asylum, was opened at Odessa. In 1899 the government granted Baron H. Günzburg permission to found a Jewish agricultural colony on his estate in the district of Bendery, government of Bessarabia. The colony is called Rossianka, and covers 500 deciatines of land, of which 400 are under cultivation, each farmer being entitled to 20. The remaining 100 deciatines are reserved for a common pasture and for future enlargements of the farms. All the settlers, except soldiers that have served their time, must be graduates of some agricultural school; and all storekeepers must be Christians ("Aḥiasaf," 1899, p. 361). In 1900, according to the latest reports, there were more than 100,000 Jewish agriculturists in Russia cultivating their own farms, 60,000 of whom are settled in 170 colonies. In South Russia, Jews in great numbers seek work on Christian estates and find ready employment there. In Siberia, especially in the district of Krasnoyarsk, there are numerous Jewish agriculturists who have established themselves on single farms; and, except as to their religion, they differ little from the general mass of the peasants. 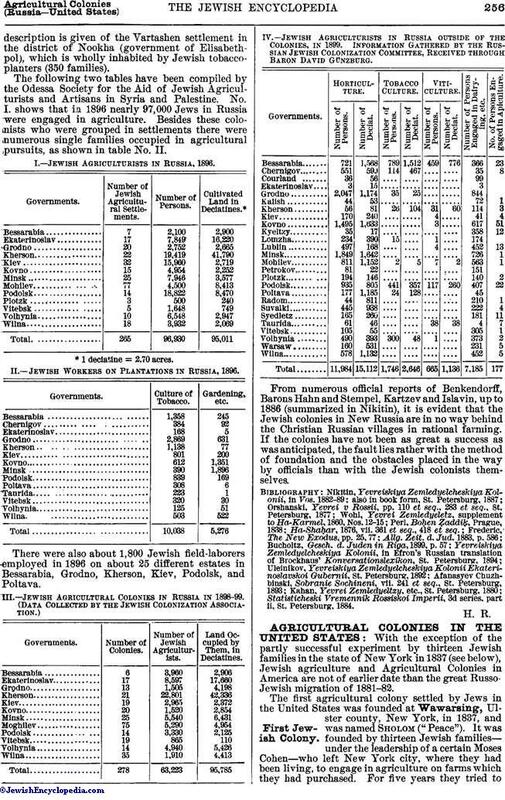 In Poland, according to the official statistics of 1887, Jews owned about 270,000 deciatines. In the government of Plotzk there are three settlements, Kukhari, Dzhikovich, and Rodolobovka, which were founded in the thirties by the local Jewish landowner, Solomon (Zelman) Posner, who enjoyed the protection of the vice-regent, Count Paskevich. These settlements are in a flourishing condition and are inhabited by 500 Jewish farmers. There are also some farmers scattered in the government of Radom. In Bessarabia many Jews cultivate the vine. There are nine colonies, mainly in the district of Soroki, with a population of 4,300 and an area of over 3,000 deciatines. In the same district there are about twenty villages entirely inhabited by Jews, who cultivate the vine, tobacco, and fruit ("Vos." April 20, 1900). In the periodical "Kaspi" for April, 1895, a gooddescription is given of the Vartashen settlement in the district of Nookha (government of Elisabethpol), which is wholly inhabited by Jewish tobacco-planters (350 families). 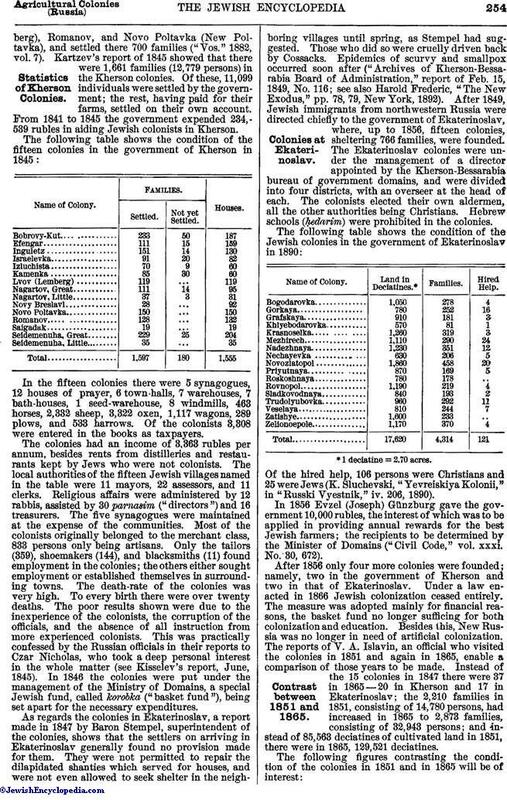 The following two tables have been compiled by the Odessa Society for the Aid of Jewish Agriculturists and Artisans in Syria and Palestine. No. 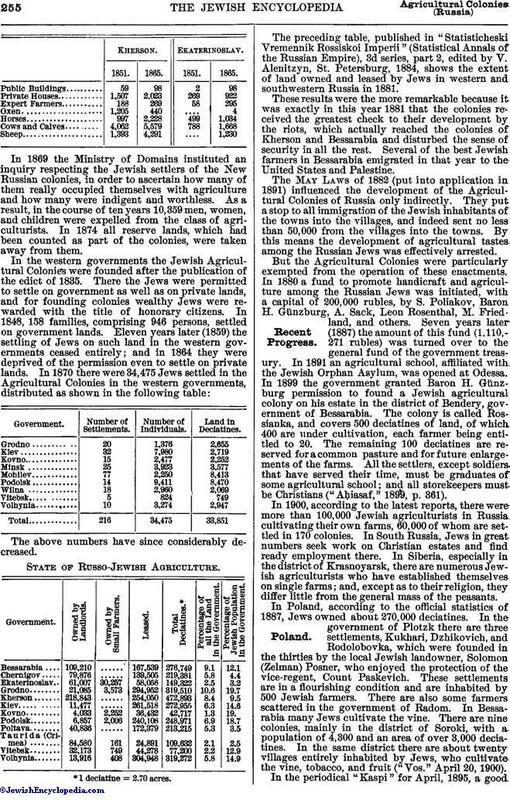 I. shows that in 1896 nearly 97,000 Jews in Russia were engaged in agriculture. Besides these colonists who were grouped in settlements there were numerous single families occupied in agricultural pursuits, as shown in table No. II. I.—Jewish Agriculturists in Russia, 1896. Number of Jewish Agricultural Settlements. II.—Jewish Workers on Plantations in Russia, 1896. There were also about 1,800 Jewish field-laborers employed in 1896 on about 25 different estates in Bessarabia, Grodno, Kherson, Kiev, Podolsk, and Poltava. Land Occupied by Them, in Deciatines. IV.—Jewish Agriculturists in Russia outside of the Colonies, in 1899. Information Gathered by the Russian Jewish Colonization Committee, Received through Baron David Günzburg. Number of Persons Engaged in Dairying, etc. No. of Persons Engaged in Apiculture. From numerous official reports of Benkendorff, Barons Hahn and Stempel, Kartzev and Islavin, up to 1886 (summarized in Nikitin), it is evident that the Jewish colonies in New Russia are in no way behind the Christian Russian villages in rational farming. If the colonies have not been as great a success as was anticipated, the fault lies rather with the method of foundation and the obstacles placed in the way by officials than with the Jewish colonists themselves. Statisticheski Vremennik Rossiskoi Imperii, 3d series, part ii, St. Petersburg, 1884.